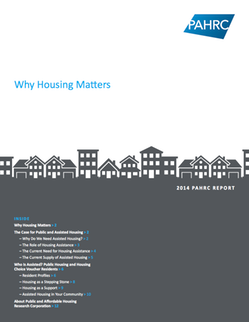 Why Housing Matters – 2014 PAHRC Report, the inaugural PAHRC Report, explores the importance of a stable, decent home to low-income families and the role affordable housing plays in communities. It demonstrates that low-income families are positioned to experience greater housing instability and housing problems than households at least one step above the poverty line and investigates how assisted housing programs provide crucial supports to communities. It also illustrates how children, seniors, and disabled individuals are the main beneficiaries of assisted housing programs and shows that there is not enough assisted housing to meet the growing need for affordable housing.